BOSTON, Mass. /Massachusetts Newswire/ -- Truebridge Inc. announced today the launch of the "Business Answer Center," a new marketing system that provides the bank and credit union clients of Truebridge with an innovative way to deliver financial education to their business customers and generate sales at the financial institutions. 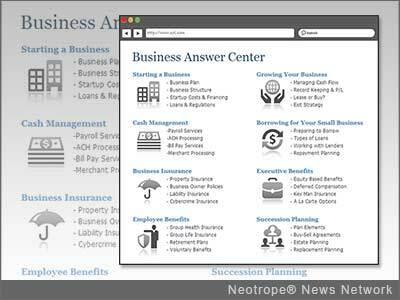 The Business Answer Center builds on Truebridge's highly successful Financial Answer Center that its bank and credit union clients have been using to serve individual consumers who need financial education. Both can be delivered digitally or through branch channels and have the added benefit of generating more sales opportunities. "The Business Answer Center is an outstanding addition to our product line," said Stewart Rose, CEO of Truebridge. "Banks and credit unions serve both individual consumers and businesses, and now we have the line extension to reach businesses as well." Rose added, "We understand that small business owners seek to become better informed before making important decisions, and research shows that they will buy from those who provide that information." The range of topics that the Business Answer Center covers for small businesses includes: How to start and grow a business; How to borrow; How to conduct cash management; How to save for retirement; Exiting a business; and much more. Truebridge is now providing a broader education-based marketing system geared to bringing consumers and business customers to their financial institution for trusted advice and relevant solutions, added Rose. Truebridge presents financial education as a value-added service with the objective to generate more selling opportunities for all products and services and do it in a way that builds customer loyalty. The Business Answer Center is fully integrated with all Truebridge marketing services within its Smart Life Connect program. More information: http://www.truebridge.com/product/business-answer-center/ . About Truebridge, Inc.: Boston-based Truebridge services banks and credit unions nationwide as the leading provider of innovative marketing solutions for financial institutions. Its branch- and web-based financial education programs are centered on life events and have the benefit of generating sales through multiple business lines. Recently the company added 28 new clients in just six months. Learn more at: http://www.truebridge.com/ . Copyright © 2013 MassachusettsNewswire™ and Neotrope®. Massachusetts Newswire is a publication of the Neotrope News Network and a TM of Neotrope.